If you need an easy tasty complete meal look no further! 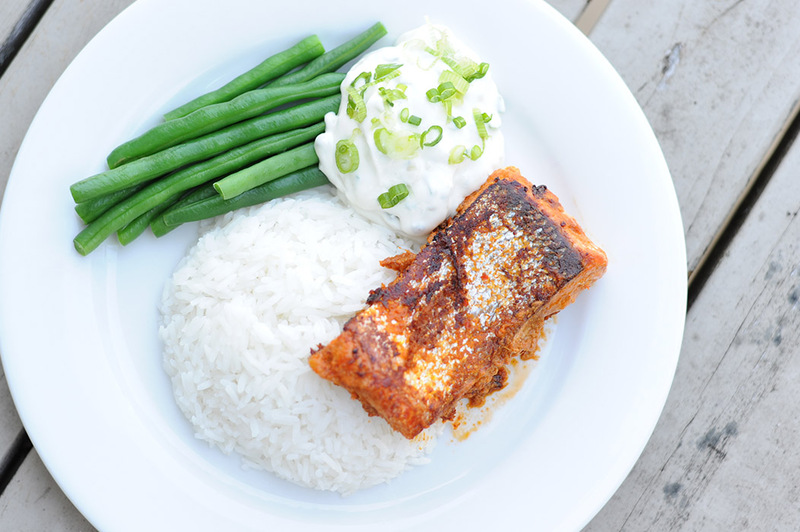 Thai salmon with coconut rice takes 25 minutes plus marinating time when you have my homemade Thai red curry paste on hand. The coconut rice is delicious and is ideal for other meal combinations as well. The refreshing sour cream sauce is a perfect contrast to the spiciness of the curry paste, and can also be used as a simple dip for sliced vegetables. We love our salmon pan-fried for a crisp texture on the skin. 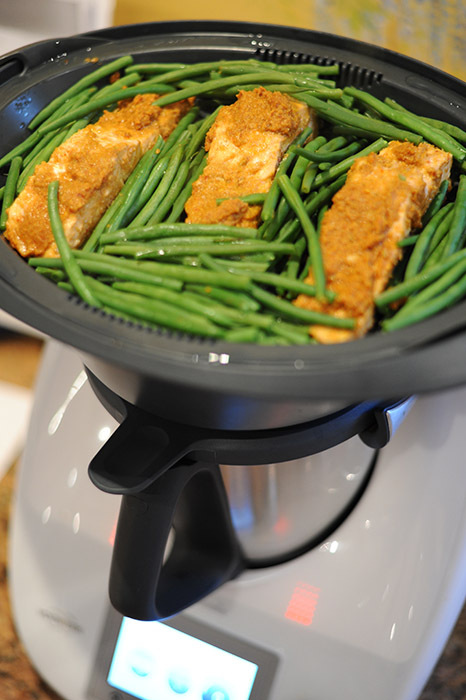 You can also steam the salmon with the green beans and rice to make an ‘all in one’ steamed meal – see tip. Once you’ve tried this recipe, why not use the paste with its authentic Thai flavours to marinate chicken or vegetables or to make wonderful Thai curries! Place a large shallow dish on TM lid and weigh in curry paste and 100 g of the coconut cream, stir until evenly mixed then add salmon and turn to ensure it is evenly coated. Cover bowl and leave to marinate in fridge 2-24 hours. Place a small serving bowl on TM lid and weigh in sour cream, honey, lime juice and finely grated zest, spring onions (reserving a few for garnish) and pepper, then stir until evenly mixed. Keep in fridge until serving time. Place green beans on Varoma tray then set aside in Varoma dish. Insert simmering basket in TM bowl, add remaining 300 g coconut cream, water, rice and sea salt, then ‘rinse’ rice 15 sec/speed 6. Place covered Varoma in position on TM lid and steam 19 min (TM5) or 17 min (TM31)/Varoma/speed 4; meanwhile pan fry marinated salmon with coconut oil over a medium heat or barbeque until cooked. 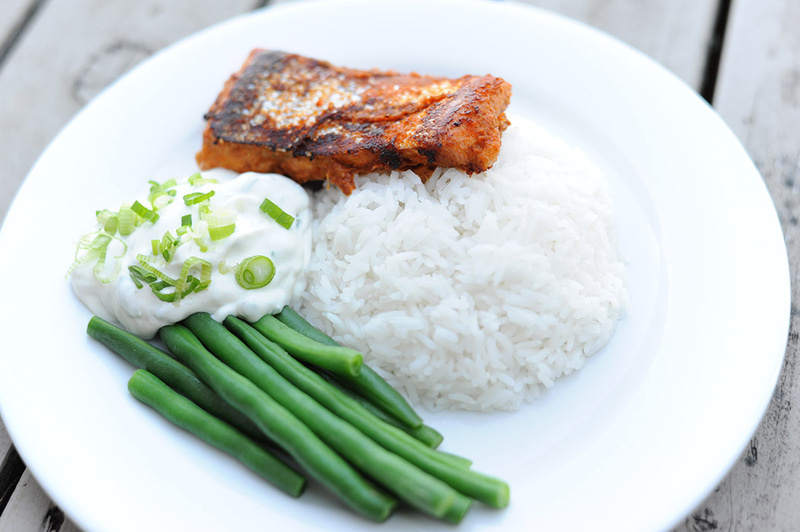 Serve with coconut rice and a generous helping of sour cream sauce and smile with delight! If your coconut oil or palm oil is solid, simply sit the closed jar or bottle in a bowl of hot or just boiled water until the oil liquefies.